The tragic events that unfolded in Charlottesville, Virginia on August 12, 2017 shocked Nitasha Duran, a final year Social Work major at Andrews University. The overt racism and need for more of God’s love burdened her mind. Even though she lived in Berrien Springs, Michigan, as a young adult, she felt compelled to do something to confront the issue of racism and hate. “It was really heavy on my heart,” Duran recounted. “I wondered, how do I get people to talk about this?” She did not want dialogue alone; she wanted life-changing action. Duran teamed up with close friends and they set out to ensure that God’s Spirit would unite Andrews students during the new school year. She also aimed to reach out to residents who needed help in neighboring communities. Her desires gave birth to the idea for a prayer walk around the campus. 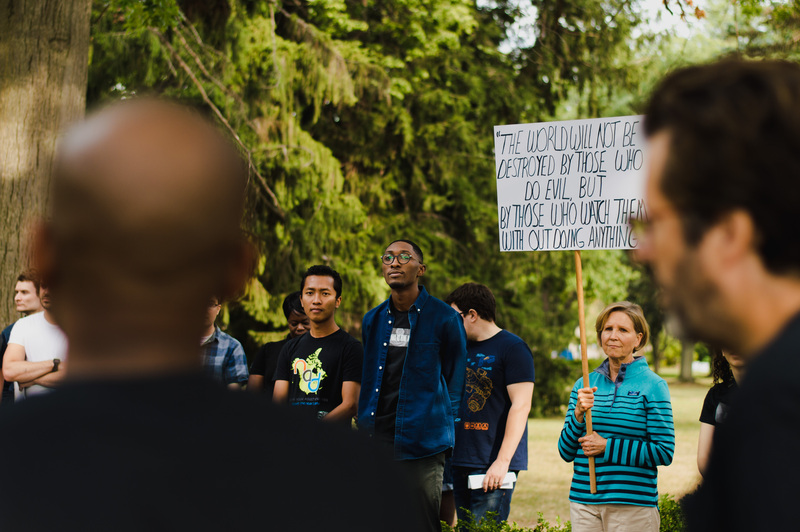 On Sunday, August 27, the day before school resumed for the fall semester, Duran along with dozens of students, faculty members, pastors and chaplains gathered for the “Hate Has No Home Here” prayer walk. Individuals gathered at the Seventh-day Adventist Theological Seminary on the campus of Andrews University to launch the walk and purchase T-shirts to help contribute to a fund for those in need in Benton Harbor, a nearby urban area. Beginning at the entrance of the campus, the prayer group of more than 50 individuals walked to major spots on campus and prayed for healing, confession of sins and praised God for His continued blessings. In between prayer sessions, participants sang hymns and carried signs with messages promoting love over hate. Almost a dozen persons who were present on campus for other reasons suddenly joined in the march when they saw what the group was up to. Dual degree student Deslynne Roberts recalled the walk being a moment that was deeply spiritual for her. “It allowed me to reflect on the need for prayer in these times when there is a lot of hate and divide.” Valerie Sigamani described the walk as a “reverent, spiritual occasion.” She took part because she wanted to help send the message that hate had no place on the University campus. The event comes months after a video emerged where a group of Andrews students challenged the administration to do more in order to serve the diverse student population. U.S. News & World Report Best Colleges edition has ranked the institution second for ethnic diversity for the last two years. Michael Nixon, vice president for diversity and inclusion at Andrews, described the event as joyful and shared that although other methods can be used to combat the issue, prayer is an effective weapon against racism. His appeal to each person is to be introspective and consider their own attitudes first. “Look to see if there is any potential bias,” he encouraged. “See the value of those around you and treat everyone with dignity.” Nixon felt confident that if students, staff and faculty members could commit to treating each person with respect, the campus would be a safe place for every individual, irrespective of background. Putting together the event did not come without fears. “I was afraid no one would show and that persons would see my effort as a failure,” Duran said. Despite her anxieties, she pushed through. Facebook invites were sent out and friends shared the event with others. Duran contacted as many persons as possible, including professors, pastors and chaplains on campus to solicit their help. As a result of the event, Duran raised approximately $400 which was donated to the Harbor of Hope Church in Benton Harbor to help children. Felecia Datus obtained a Master's degree in communications at Andrews University, and she is passionate about mission work. She served as managing editor for Envision Magazine and is a contributing author at theprayingwoman.com. A version of this article originally appeared in the Andrews Agenda and is reprinted here with permission from the author.